Cut the aubergines in half lengthways, without peeling them. Cook them in a skillet with olive oil and Provencal herbs. 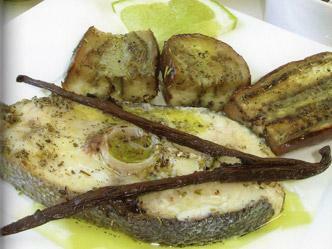 In the same skillet, let fish slices fry, covered with olive oil and accompanied by one vanilla pod, previously split lengthwise. Serve this dish with fresh grapefruit juice.